Did you know that only 15% of companies are able to tie the calculation of customer lifetime value to revenue & growth and that nearly 50% of all companies cite the lack of a consistent cross-channel experience as an impediment to loyalty? Forbes Insights and Sailthru recently surveyed 300 global retail and media executives to find out if, and how, they take advantage of the benefits of retention strategies and how that impacts growth and performance. 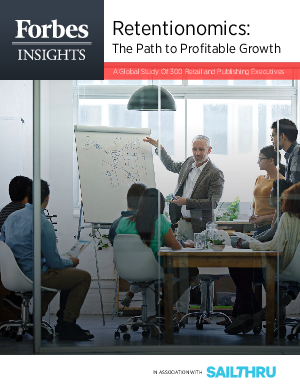 This study, Retentionomics: The Path to Profitable Growth, presents the findings from our research and equips marketing leaders with the insights on acquisition and retention needed to drive growth at their own organizations.